We learned the hard way that running with the residual effects of the flu and neglecting training certainly has an effect on one’s running performance. The Dallas Rock n Roll Half Marathon was not the bucket of monkeys for which we had hoped. 5:30 a.m. Sunday arrived about 7 days too soon as I was still dealing with a hacking cough. And as tempting as it was to sleep through the starting horn, we pulled ourselves together, loaded up the Conestoga and headed South 30 miles to downtown Dallas. Added to the misery of running without training and with flu effects was the weather. Cold winds from the NW meant running 13.1 miles in layers. We stopped at Wal-Mart on Saturday and pickup up some super cheap Chinese made sweats to shed as we warmed up. Sunday morning, the temp was in the mid-30s. We parked about a block from the Omni hotel, and, with about 5,000 others, huddled in the lobby to warm up. About 7:50, we headed to the starting corrals. This year was a new route, east through downtown over to Deep Ellum, back to near the start, through Dealy Plaza, over the Margaret Hunt Hill bridge across the Trinity River, which S thought was cool, through the trending Bishop Arts District and then back to the Reunion Hyatt Hotel. Running in the cold dilates time and distance. Whereas I am usually in good spirits and enjoying the event through mile 7, yesterday, I was shocked how long it took to get to mile 2. By then, my upper thigh muscles were aching, nose running, lungs heaving. But as is the case, a runner just keeps plodding along. S and I were both tagged so that text messages were sent as we crossed each timing pad, so as soon as I would cross one, a ding would sound in my earbuds, then I would count to see when S would cross the same mat behind me. Through about mile 10, she stayed about 90 seconds behind. But we both slowed dramatically after mile 10. About mile 11, I had a sudden bout of light headedness, which, having seen a runner collapse in an earlier race, thought it best to walk/run the rest of the Half. I think the cold, and all the cold meds I was doped up on, the lack of training and the stress of running culminated in a near pass out experience. So I probably walked about 3/4 of the last 2.1 miles. Better to finish ambulatory rather than in an ambulance. So my usual time of 2:05-2:08 ended up 2:17. S came in at 2:24 after her last 5K walk/run. I think we were both surprised by the number of hills in Southwest Dallas. Even the woman who won the race in 1:15 or so commented on the hills. There was a particularly brutal one between miles 8 and 9. We grabbed our medals at the finish, snagged a foil blanket and stretched out in the sun long enough to have a banana and water. 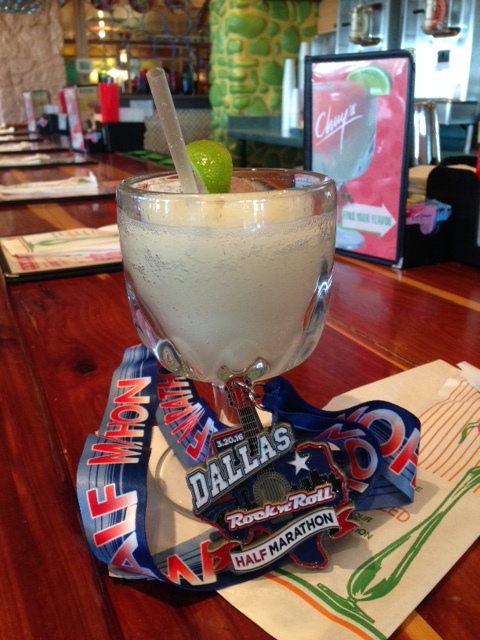 Time to start thinking about the next race over post-race Margaritas and enchiladas at Chuys. This entry was posted in Winnebago. Bookmark the permalink.